Home › Desserts › Blackberry picking – fun and free! Blackberry picking – fun and free! I love this time of year and start to get completely obsessed by what I can find in the hedgerows. Blackberries are always the first thing that get me all excited about the change of season. I start to look for fruit trees whenever I’m out and about in the hope that I can find apples or plums – last year I found a plum tree in the middle of a field near my brother’s house and made jars and jars of jam with them. I even managed to freeze a load and made crumbles with them through the winter. He is on high alert to let me know when they are ripe this year! 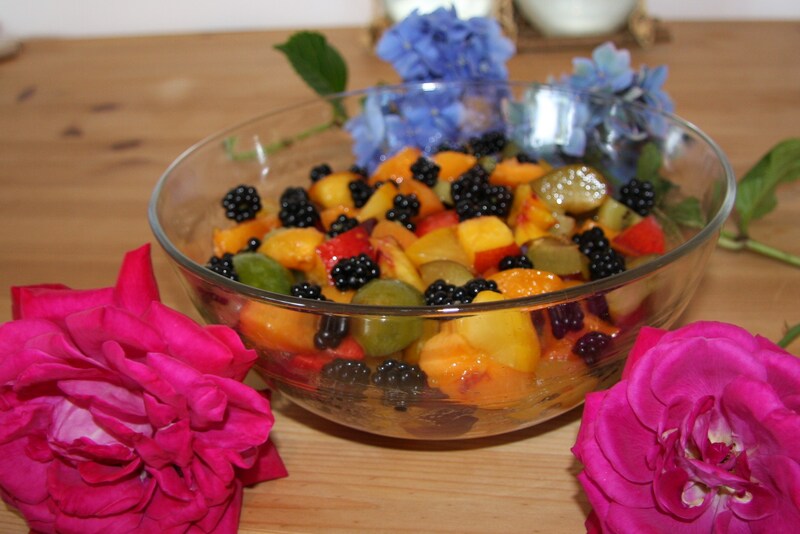 I am on holiday in France this week with my two kids and the opportunities for baking are a little limited so it’s great to be able to pick blackberries and put them in a fruit salad with the amazing fruit you can get in the supermarkets here really cheaply – apricots, plums, greengages and nectarines. Delicious. And somehow it feels even better to be eating fruit straight from the fields, particularly when you have the bramble scars to show you have made the effort to do it yourself! I made this one with yellow and red plums, greengages, nectarines, kiwi, apricots and of course the blackberries. Vraiment delicieux!